Coworking vs. Office Space: What’s the Right Mix? When the coworking industry started in in the mid-2000s, most coworking owners were against creating closed-off offices in their spaces. Offices were perceived as ‘the man’ creeping into our chaotic perfect world of open and collaborative coworking communities. The mood started to change as the industry learned how to add offices and integrate office members into the greater coworking community. Owners found that offices had many advantages to the business of coworking, as well as benefits for the community as a whole but there becomes a tipping point when offices do more harm than good. 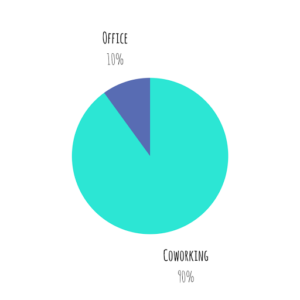 To have a successful coworking space, you have to find the right balance between the two environments.Here are examples of office-to-coworking ratios and the effects it can have on the business and community. As you can see, offices can be beneficial from a business perspective because it provides a stable revenue source that is easier to sell. Offices give coworking space owners peace of mind. However, when offices dominate the space and culture, it limits the appeal to only small businesses or teams–and doesn’t move the industry forward in a way that the coworking movement likes. If you’re a new space owner, consider adding a few offices to provide some revenue and get people in the door. 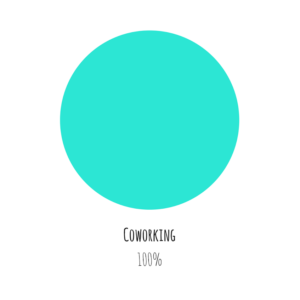 But stay committed to the coworking cause. A general rule of thumb to follow? Have enough offices so the revenue covers the rent of the entire operation. This usually happens when 15% of the space is dedicated to offices. That way, the business can stay open while coworking takes off.